This RPG-302V3 is only for avail with 3ch Transceiver . The 3rd channel must be a trim , If it is push button style, no avail to use V3. 1: Easy on setting up End point, push the set up button while ..
1: Easy on setting up End point, push the set up button while in max angle for both side. 2: Gain control is possible from the transceiver, easy to operate right and left independently. 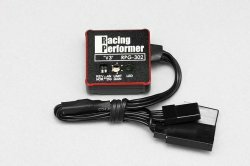 The new gyro is the Racing Performer(RP) brand family, named as RPG-302 V3. mild steering performance to achieve a realistic drifting angle. And now, new model RPG-302 V3 has a new feature , Adjustable Steering End Point. in accordance with the surface environment and track layout. red color to show its specialty at the track. for AWD(4WD) car which is more less steering angle due to the mechanical restriction. By setting up the steering end point, even the AWD car can perform the realistic drift in safety operation. Simply enter your details below and we will send you an e-mail when “RPG-302-V3 V3 drift steering gyro” is back in stock!